In order to avoid, or at least delay, the effect of a higher interest rate, one option that property owners or buyers can consider is the fixed rate mortgage. In Singapore, banks typically don’t have long term fixed rate mortgages, allowing borrowers to fix their rate for a maximum of 3 or 5 years. Only HDB loans are kinda fixed for the entire tenure of the loan. Fixed rate mortgages have higher interest rates compared to the floating rate mortgages. This is basically a “risk premium” for the bank, as they would be locked in for 3 years with no chance of re-pricing even if interest rates shoot up. The fixed rate mortgage has fallen out of favour in recent years due to the expectation of the interest rate to stay low, and rightly so. Singapore interest rates track the US LIBOR closely and the LIBOR is expected to stay low as long as Bernanke continues printing money. 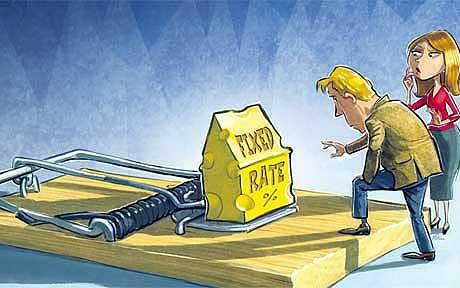 Fixed rate mortgages are more useful when rates are expected to move up. Since I do expect that interest rates will go up, this is definitely an avenue worth exploring for me. The question is, when should I lock in the rates? Ideally, I would like to lock in just before rates start moving up, just like I would like to catch the bottom or the top of the stock market. Unfortunately, I’m never that lucky so I’m going to have to make an educated guess and hope that I’m not too far wrong. So what do we know? We know that Bernanke is buying US$85 billion of assets a month until unemployment rates goes below 6.5%. A quick search on Google tells us that US unemployment is currently at 7.5%. Various reports say that if employment continually increases by 250k per month, the 6.5% target will be reached by mid 2015, while at 200k more people employed per month, the 6.5% target will be reached by end 2015. Give a little room for monitoring and I’d say there’s a good chance that the Fed will only start raising rates in 1Q 2016, but rates should move up pretty swiftly once they start. In order to take advantage, you don’t actually want to be too close to the edge, or even worse, when they actually start raising rates. The reason for this is that the market is generally forward-looking. By the time you actually see rising rate, the banks would have priced in the rising rates already. In fact, if you look at the yield curve on the US Treasuries, you would see that the curve has been steepening over time, reflecting the belief that interest rates will increase in the future. If things continue to move at current pace, I will be looking to refinance my floating rate mortgages to fixed rates some time in 2015. Hopefully the fixed rates would not have run up too high by then. Thanks for the helpful analysis. Most banks now give an interest rate info-sheet to educate investors on how much more they have to pay if rates increase. It is an unpleasant but critical reminder to all investors on how sensitive they are if rates inch up north. Thanks for reading! We think that interest rates are not going to stay down forever, and would like to remind all our readers not to over-stretch themselves in their property purchases. Personally I use a 3.50% pa interest rate when calculating affordability to put in sufficient buffer for interest rate hikes.